1. To put an end to a customary, or enforced, separation of ethnic or racial groups based on gender in a place or institution; for example, in a workplace or a school: The members of the union of school janitors voted to desegregate their union and to welcome women as equal members. 2. To admit affiliates of all races or ethnic groups equally; especially, by force of law: The Civil Rights movement in the United States made significant gains when it was able to desegregate many schools, lunch counters, etc. 1. To divide into parts, to break up. 2. To become separated or disunited. The breaking off or separating of something. 1. To persist in or to remain determined to achieve a purpose, idea, or task: Jim persevered in the face of obstacles and discouragements and refused to stop building a shed for the bicycles of the children who were living in his apartment building. 2. To strive steadily and be resolved and to maintain one's efforts; usually, over a long period and despite problems or difficulties: Glenda persevered in her university studies and graduated at the top of her class. 3. 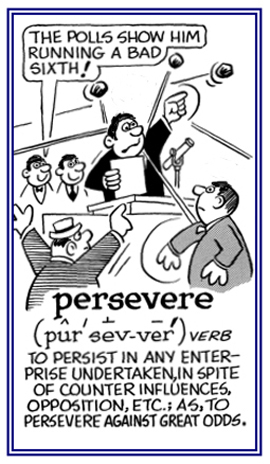 Etymology: from Old French perseverer, from Latin perseverare, "to continue steadfastly, to persist"; from persevereus, "very strict, earnest", from per-, "thoroughly" + severus, "strict". © ALL rights are reserved. Self baptism: "Back in 1606 there was a Christian congregation in England that was pastored by John Smyth. In 1608 this church emigrated to Amsterdam because of religious persecution in England." "While in Amsterdam, Smyth became convinced that the scriptures require believers' baptism, not infant baptism. Since Smyth had not been baptized in the way he felt was correct, he baptized himself, then baptized the other members of the church he was leading." 1. Someone or those who baptize themselves: "John Smyth (Smith) was called a Se-baptist or a sebaptist because it is said that he believed that as a baby such a religious ceremony was invalid; so, he baptized himself in Amsterdam in 1608 after leaving England because of religious persecution." 2. Etymology: from Latin se-, "one's self" + baptista, "a baptizer". G. & C. Merriam Company, Publisher; Springfield, Massachusetts; U.S.A.; 1952. 1. To make a formal withdrawal of membership from an organization, state, or alliance. 2. To withdraw formally from a union, fellowship, or association; especially, from a political or religious organization. 1. A formal withdrawal from an organization, state, or alliance; especially, from a political or religious association: Janet had to write a formal statement to insure that her secession as a member of the political party was confirmed. 2. Etymology: from Latin secessionem, from the stem of secedere. "secede" which consists of se-, "apart" + cedere. "to go". 1. To keep or to shut oneself away from the company or the association with other people: Henry secludes himself and only sees his mother once in a while. 2. To make a place very private and quiet by isolating it from anyone else: Jerome secluded a home deep in the forest where nobody ever goes and lives as a hermit who has no contact with other individuals. 3. 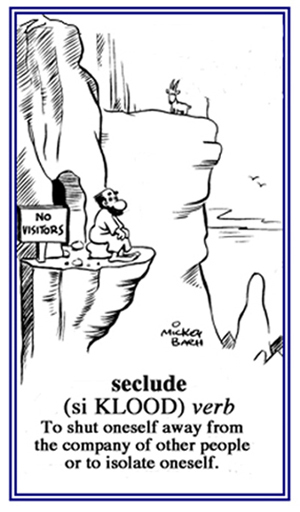 Etymology: from Latin secludere, "to shut off, to keep out"; from se, "apart" + claudere, "to shut". © ALL rights are reserved. 1. The state of being isolated or in a remote area or region: The couple loved their vacations on the island where they enjoyed complete seclusion, away from work and from strangers. 2. A place of concealment or a private location: Little Tommy had his own spot of seclusion, which was behind the door of the closet in his room! 1. A concealment or a condition of being concealed or hidden: David's movements were detected in spite of their secrecy. 2. Etymology: existing from about 1423, secretee, "quality of being secret"; from Old French secré, a variant of secret which is from Latin secretus, "set apart, withdrawn, hidden"; originally the past participle of secernere, "to set apart"; which came from se-, "without, apart" with the extended meaning of "on one's own". 1. Known by only a few people and intentionally withheld from general knowledge: "I want to tell you a secret, but you must promise not to tell anyone else." 2. Keeping information hidden from other people or to very few people and consequently quiet and secluded: "They lived in a secret location of the suburbs." 3. A special or unusual way of doing something to achieve a good result: "She shared her beauty secrets with the small group." 4. Something which cannot be explained: "There are many secrets of the universe and even of many aspects of nature here on Earth." 5. Etymology: anything that is secret is "separated" from others; hence, "put out of the way, hidden". The word comes via Old French secret from Latin secretus, an adjectival use of the past participle of secernere, "to separate". This was a compound verb formed from the prefix se-, "apart" and cernere, "to separate". From the 16th to the 18th centuries, secret was used as a verb, meaning "to hide", but it was then altered to secrete, based on the model of Latin secretus. 1. Someone who does general clerical and administrative work such as word-processing, filing, and arranging appointments for an individual or an organization; someone who is entrusted with secrets; a confidential officer. 2. In the United States, an official who advises the President in various fields and who is selected by the President and is in charge of a particular department of the government; such as, Attorney General, Secretary of Agriculture, Secretary of Commerce, Secretary of Education, Secretary of Energy, Secretary of Health and Human Services, Secretary of Housing and Urban Development, Secretary of Labor, Secretary of State, Secretary of Interior, Secretary of Treasury, Secretary of Transportation, and the Secretary of Veterans Affairs. Is anyone missing? 3. Etymology: "a person entrusted with secrets", from Medieval Latin secretarius, "clerk, notary, confidential officer, confidant"; from Latin secretum, "a secret". The meaning, "a person who keeps records, writes letters, etc. "; originally, for a king, was first recorded in about 1400. 1. Free from danger or attack; such as, a secure fortress. 2. Free from risk of loss; safe: "Her papers were secure in the safe deposit box." 3. Free from the risk of being intercepted or listened to by unauthorized people: "Only one telephone line in the embassy was secure." 4. Free from fear, anxiety, or doubt. 5. Not likely to fail or give way; stable: "She used a secure stepladder when she wanted to get objects from her high bookcase." 6. Firmly fastened: such as, a secure lock. 7. Reliable; dependable: "He always tried to make secure investments." 8. Assured; certain: "With three soccer goals in the first period, they had a secure victory; but somehow they lost the game." 8. Archaic, being careless or overconfident. 9. Etymology: "without care," from Latin securus, "without care, safe"; from secura, which came from se, "free from" + cura, "care". Meaning "firmly fixed" (of material things) is from 1841, on the notion of "affording grounds for confidence". Security is attested from 1432, from Latin securitas, from securus. 1. To guard from a risk of loss or from danger. 2. To make tight, to fasten, to make firm. 3. To obtain or to acquire possession of something.